NEW ORLEANS, La.—Fred Luter Jr. is accustomed to overcoming obstacles and beating the odds. The senior pastor of New Orleans, Franklin Ave. survived massive injuries in a motorcycle accident as a 21-year-old—an incident that led him to accept God’s call into ministry—and he moved from itinerant preaching on a street corner to grow a 65-member congregation he first began to pastor in 1986 to an 8,000-member church known world wide two decades later. Then, Katrina came to town, and everything changed. It was a dispersion of biblical proportions, Luter stressed. “I tell people as I travel, before Katrina, we were the church gathered—we would be here all the time. After Katrina, we were the church scattered, we were scattered all over the country (and are) until this day. I preached two services yesterday at Oak Cliff in Dallas, and at the first service, they had about 50 people from New Orleans. At the second service, they had about 70 people from New Orleans. And, that’s true all over the country—Dallas, Atlanta, Memphis, Baltimore, Charlotte—everywhere I go, they have people who, at one time, lived in New Orleans. Franklin Ave. members visit after worship Aug. 16. 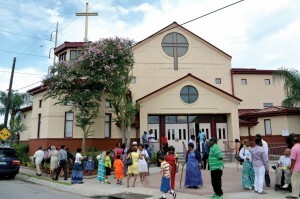 The church building was filled with nine feet of water after Hurricane Katrina hit the area on Aug. 29, 2005. 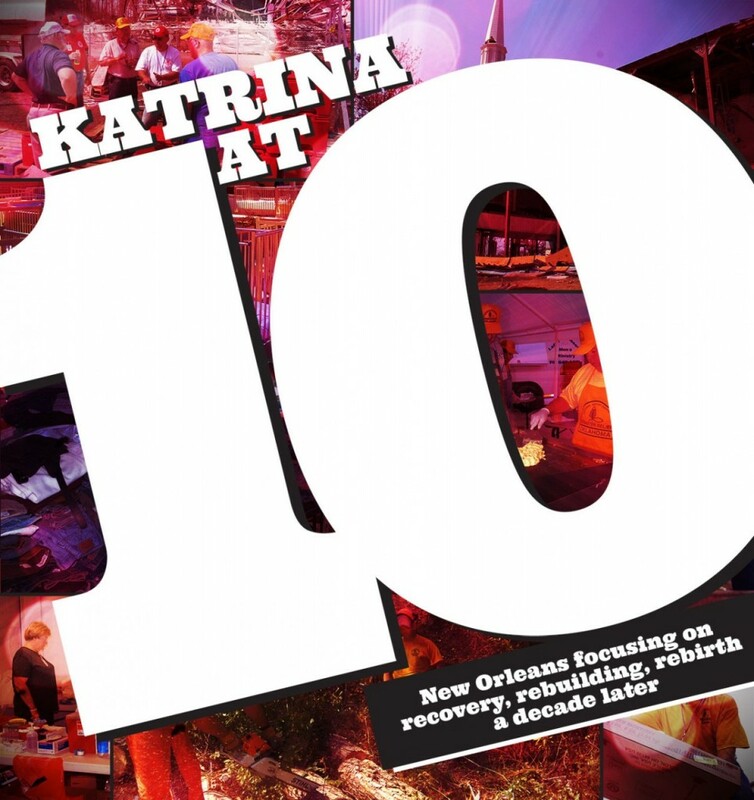 “That’s the crazy thing about Katrina; people in New Orleans have been here all their lives. If you go to Atlanta, it seems like everybody who lives in Atlanta is from somewhere else. But if you live in New Orleans, you have always been here. We never left, even during all of the other hurricanes, and that’s why it’s not unusual to see extended family members living in close proximity to each other. We never, ever left, even during difficult times. Luter, who later served as the first African American first vice president of the Southern Baptist Convention in 2011 and was elected as the Convention’s first-ever African American president a year later when the SBC Annual Meeting was held in the Crescent City, says his hometown has come a long way since the costliest hurricane in U.S. history struck New Orleans. 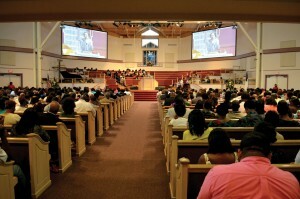 The church’s worship center was packed for the service Aug. 16. It was a major hit; however, Franklin Ave. has fared better. “We have been very fortunate, thankfully,” Luter smiled. 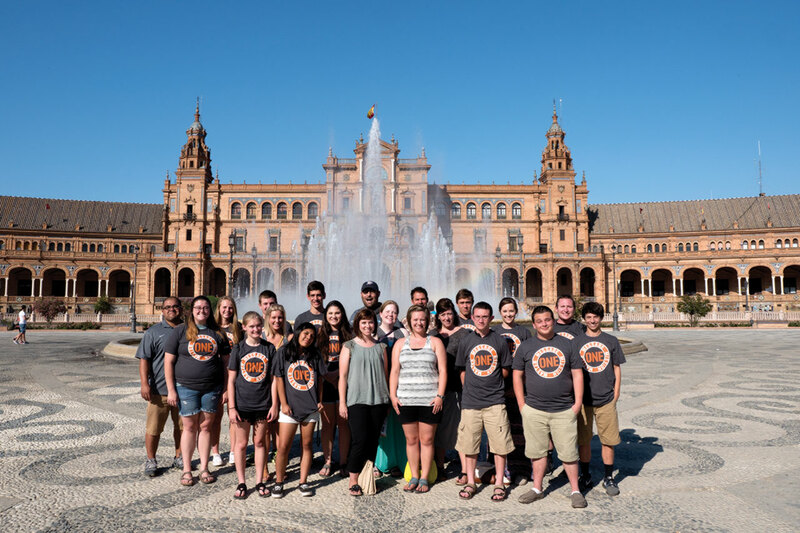 “We are one of the few churches that was able to come back and rebuild. For two-and-a-half years, we were at New Orleans, First because we had nine feet of water come into our building and we couldn’t worship here. New Orleans, First, where David Crosby is pastor, was one of the few churches in the city that did not flood, so we were able to worship there while our church was being rebuilt, and we came back here in April 2008. “We started all over again doing the things we did when I first came here in 1986 and have come back. 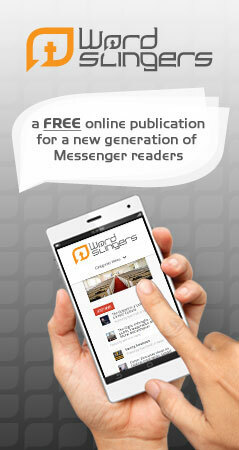 We thank God we are growing again; we have a lot of new folk who are looking for a new church home. We have been very fortunate. I pinch myself everyday because of what God has done in this place; it’s miraculous. When Katrina hit, the church leaders had already had plans drawn up for a new facility on the new property, but it suddenly was covered by 12 feet of water. 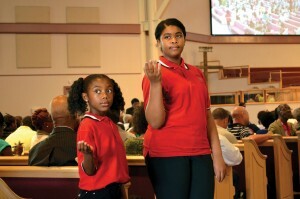 It was “Children’s Day,” and youth served as ushers, helping attendees find seats. Today, Franklin Avenue’s attendance averages between 4,000-5,000 weekly, Luter said. The church has purchased 25 acres about 10 miles east of its present location along I-10 toward Slidell, La. and hopes to begin construction in March of next year on a new facility. So, the future is looking good for Franklin Ave., and Luter, who is the virtual embodiment of Oklahoma’s favorite son—Will Rogers—whose most famous quote is “I never met a man I didn’t like.” Luter, well-known for his bear-hug greetings and ear-to-ear smile, credits much of that recovery to his friends from Oklahoma, specifically the many disaster relief and recovery volunteers who spent 17 months in New Orleans helping to clean it up, feeding the hungry and rebuilding homes and lives. “I will forever be grateful to Oklahoma Baptists,” Luter said. “(Baptist General Convention of Oklahoma Disaster Relief Director) Sam Porter and his team have been just incredible. I met Sam years ago when I preached at the state men’s retreat at Falls Creek in the old, open-air tabernacle. Sam was so gracious. He treated me like he had known me all of his life, and we really hit it off. To help manage the monumental task of helping New Orleans recover after Katrina, the North American Mission Board (NAMB), which oversees state conventions’ disaster relief work, divided the city into 22 zones, Porter said. More than 2,000 Oklahoma volunteers served in New Orleans, and prepared more than 600,000 hot meals, in addition to removing debris. “My wife, Elizabeth, and I were living in Birmingham, Ala. commuting back and forth,” Luter recalled. “Because of the curfew, you had to leave before dark. We had just talked to a man about gutting out our house at a cost of $4,000, and Elizabeth was outside talking to a neighbor when this big truck pulled up and a lady asked her if she knew where Brother Luter’s house was. She said, ‘Lady, I’m his wife.’ The lady told her, ‘We’re from Oklahoma. We’ve come out here to gut out his house.’ Elizabeth called me and told me, and, I don’t speak in tongues, but I almost did that day, it was so wonderful! 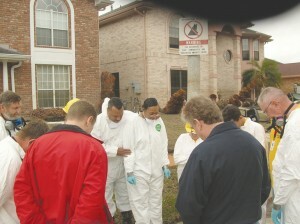 Luter and his wife, Elizabeth, right, are prayed over before Oklahoma DR volunteers begin to “mud-out” their home in 2005. “Those men and women helped us up til dark for three days straight to get our house cleaned out. They fed us, and they refreshed us with cold drinks. 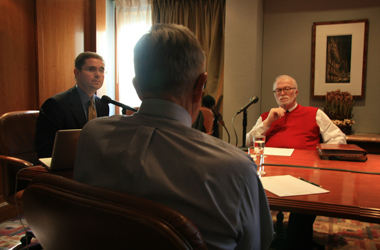 I tell that story wherever I go, and I appreciate Oklahoma Baptists so much. But, the great thing about it is, not only did they do it for me, but Oklahoma Baptists also did it for people all over this city, for other pastors, for other churches, for other people. We could not have done what we did without the assistance of disaster relief teams from Oklahoma Baptists. I will forever be grateful for what they did for us. “Not only did they talk the love of Jesus, but they also showed it by what they did. Our city, my home, my neighborhood is better for it. This is predominately a Catholic city, and at a time when the rebuilding was so slow, there was an editorial in our paper that said, if the Southern Baptists were responsible for rebuilding our city, we’d be rebuilt by now.